Wash the raw quinoa well under cold running water and strain. To cook, sprinkle into a pot of vigorously boiling water and boil for 20 minutes – you can tell when it’s ready as the outer ring separates. Strain and rinse under running water until cool. Dress the salad leaves with a couple of tablespoons of the dressing and arrange on a salad plate. Sprinkle the cooked quinoa over the leaves. 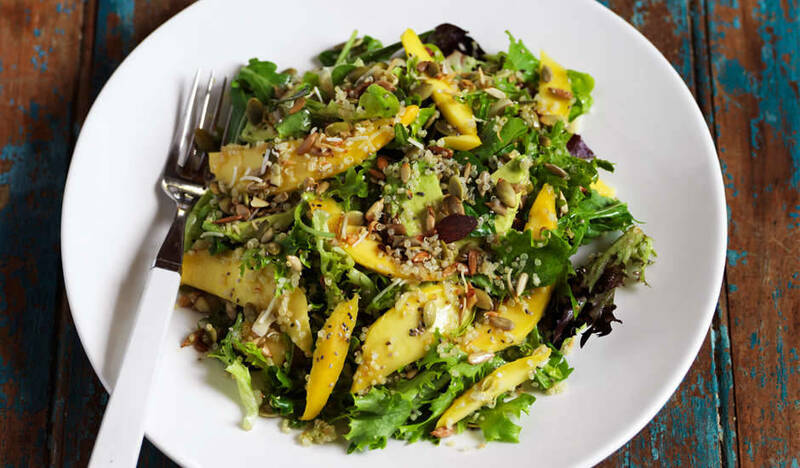 Top with the avocado and mango strips then sprinkle the seeds, coconut and serve.